Most economics books don’t have great data. This book puts research and collection of historical data as a top priority. He focuses a lot on the capital to income ration, which is the ratio between how much wealth exists in a country vs. how much income it’s pulling in. One of the main concepts of the book is the idea that there is a regular rise and fall of capital relative to the country’s income. The idea is that wealth tends to accumulate naturally until it’s disrupted by something major—either a major technological breakthrough, or something like war. He argues that income inequality was absolutely massive before the wars, and that they reduced it, and that now that we’re several decades past the wars, the wealth is growing relative to income again. The idea is that as this happens, income inequality goes up as well, which is what we’re seeing now. The basic concept is that incoming inequality, and specifically the kind we’re seeing now, isn’t an anomaly, and the cause isn’t unknown. He’s saying it’s a natural trend that we can predict and expect. His closing predicts that income inequality will continue to rise in this way unless something is done, and he recommends that governments implement a wealth tax in order to keep this natural force in check. 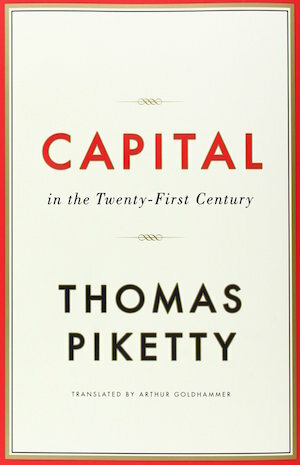 Capital in the Twenty-First Century on Amazon.